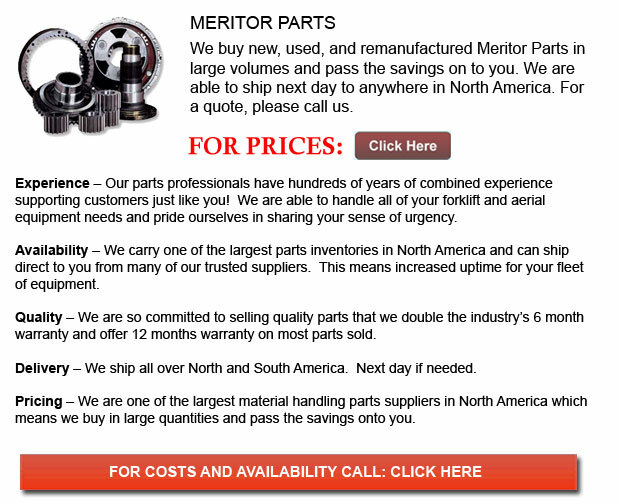 Meritor Parts - The Meritor Company is a leading international supplier built upon one hundred years of custom of quality and service. Meritor focuses on integrated systems together with a range of modules and components to the original machinery makers and aftermarket equipment in the transportation and industrial sectors. Meritor prides itself in the company's distinctive energy and thinks that this particular energy contributes to their competitive advantage within the international operations. The company values their clients and wishes to guarantee their success while anticipating their various requirements. Meritor begins with a tradition which values diversity of individuals and their broad thought processes. Operating in 19 nations and hiring over eleven thousand two hundred people, Meritor encourages innovation and collaboration among a team of knowledgeable experts. Meritor strongly believes in only hiring future focused staff. These top-caliber workers can quickly adapt to changing surroundings and freely exhibit the level of performance and commitment needed to be able to obtain results for the competitive market environment. The business empowers their teams to make sound business decisions in order to enhance the overall success of the company. In return, Meritor offers all of their employees various opportunities for professional and personal development. The Advanced Engineering team is on the forefront of components and system engineering. This comprises drivelines, axles, suspension and braking systems used for medium and heavy duty trucks, military vehicles, trailers, off-highway vehicles and buses. The Meritor Advanced Engineering team is growing. They launched a new technical center in Bangalore, India in September 2009 to be able to lead their advanced product development initiatives that represent the whole Asia Pacific region. This team is likewise responsible for supporting the needs of their global engineering personnel. Meritor's dynamic and customer focused Quality team is devoted to ensuring optimum processing at their aftermarket distribution facilities and production plants which are situated around the world in 19 countries and in 5 different continents. The supplier development network is specifically located to support new business development. Regional teams are supported by global centralized specialties, initiatives and quality systems in Six Sigma and Materials Engineering. Meritor's growing Six Sigma program promotes a data-driven, fact-based approach to decision making within each and every part of the business. The DFSS or likewise referred to as Design for Six Sigma ensures product reliability in each region. The team is even included transactional Green Belts who make use of Six Sigma tools to business techniques and implement lean techniques.